On April 10, 2015, the day before the 10th annual Alabama Book Festival, Alabama teachers in grades 7-12 from public, private, and home schools are invited to join three festival authors, Harry Moore, Marlin Barton, and Reed Farrel Coleman, at Troy University, Montgomery Campus for an exciting day of writing workshops free of charge. Two and four-year college teachers—both full and part-time—may register as space is available. These workshops are designed to introduce teachers to new strategies for integrating creative writing into language arts and English curricula. 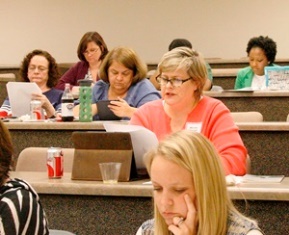 Teachers will write in both workshop sessions, share what they have written, and meet other Alabama educators. To register, send your name, school, and e-mail address to writersforum@bellsouth.net, Subject line: Teacher Workshop, or use registration form below. Participation is by pre-registration only. Directions to the workshops and maps will be provided with registration confirmation. Deadline to register is Monday, April 6. Registration: 8:45 a.m. – 9:25 a.m. Books by workshop authors will be available for purchase. Harry Moore is the recipient of the 2014 Maureen Egen Writers Exchange Award for poetry from Poets & Writers. His poems have appeared in Alabama Literary Review, POEM, South Carolina Review, Avocet, and Sow’s Ear Poetry Review. He has published two chapbooks, What He Would Call Them and Time’s Fool. Moore serves as assistant editor of POEM magazine. A retired community college English professor, Moore lives with his wife, Cassandra, in Decatur, Ala. Lunch: 11:20 - 12 noon. Marlin Barton with Pasture Art. Marlin Barton will read from his latest short story collection, Pasture Art. Barton is from the Black Belt region of Alabama and has published two novels, The Cross Garden and A Broken Thing, and two previous short story collections, The Dry Well, recipient of the 2001 Dictionary of Literary Biography Yearbook Award for the best first volume of short stories, and Dancing by the River. He teaches in and directs the Alabama Writers’ Forum’s Writing Our Stories, a creative writing program for juvenile offenders. He also teaches in the low-residency MFA program at Converse College. Barton lives with his wife, Rhonda Goff, in Montgomery. Reed Farrel Coleman, called a hard-boiled poet by NPR’s Maureen Corrigan, is The New York Times bestselling author of Robert B. Parker’s Jesse Stone series. He is a three-time recipient of the Shamus Award for Best PI Novel of the Year and a three-time Edgar Award nominee in three different categories. He has also received the Macavity, Audie, Barry, and Anthony Awards. He is as a former executive vice president of Mystery Writers of America and a founding member of Mystery Writers of America University. Coleman is an adjunct instructor of English at Hofstra University. Brooklyn born and raised, he now lives with his family on Long Island. Wrap-up: 2 -3 p.m. Participants complete evaluations and receive a certificate of participation for 8 contact hours. Authors’ books will be available for purchase courtesy of Capitol Book and News Company, the official Alabama Book Festival bookseller. The Alabama Book Festival Teacher Workshop is made by possible by generous support from Troy University, the Support the Arts Car Tag, the Alabama State Council on the Arts, the National Endowment for the Arts, and the Alabama Writers’ Forum. April 10, 8:45 a.m-3 p.m. Registration begins at 8:45 a.m. Lunch is provided onsite. Workshops begin at 9:30 a.m. and conclude at 3 p.m., including evaluations and book signings. Fifty slots for teachers and counselors interested in creative writing are available. Slots will be filled on a first-come, first-served basis. If you have questions about attending, please phone the Alabama Writers’ Forum at 334-265-7728. A map to the workshop location on the Troy University, Montgomery Campus will accompany your confirmation letter.